Technology has become a key component in educating today’s students. 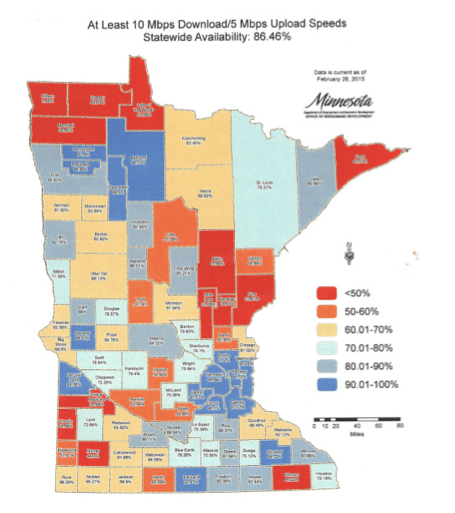 Yet, in rural Minnesota broadband access remains sparse. View printer-friendly brief on this issue. Currently 72 rural counties have less than 90% household access to the former standard of broadband: 10 Mbps download and 5 Mbps upload speeds. Thirteen rural counties have less than 50% of their homes with that level of broadband speed available to them. Based on the 2015 Federal Communications Commission (FCC) definition of broadband, most rural Minnesota households and businesses are not served. A lack of accessibility based on geography is amplified by the income divide and affects the school readiness and the academic achievement of our children. This is beyond telecom access aid for school districts for broadband at school. What will continue the upward trend in broadband accessibility over the past two years as reported in the Blandin Foundation report?• Increased state broadband funds? • Increased awareness by communities as to the importance of broadband access? • Support from foundations such as the Blandin Foundation? Should broadband home access be considered as essential to education as school lunch? Should eligibility for free and reduced lunch trigger state support for home broadband where available?